Atomic container of shared memory pages. Implemented using a collection of Segments, each with a PageStack index of free pages. All pools must be created by a single process. Definition at line 25 of file PagePool.h. Definition at line 52 of file PagePool.h. Definition at line 28 of file PagePool.h. Definition at line 27 of file PagePool.cc. Definition at line 34 of file PagePool.h. Referenced by Init(), and level(). Definition at line 44 of file PagePool.cc. 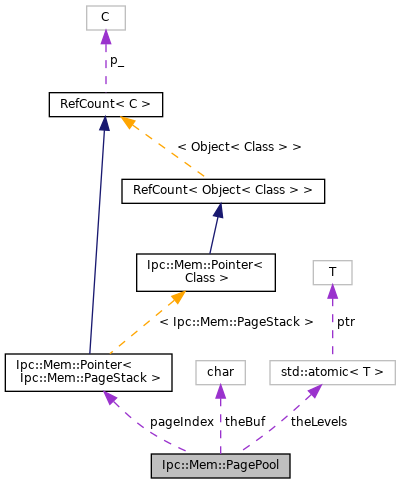 References Ipc::Mem::PageId::maxPurpose, Must, pageIndex, Ipc::Mem::PageId::purpose, and theLevels. Definition at line 19 of file PagePool.cc. References capacity(), pageSize(), and shm_new. Definition at line 39 of file PagePool.h. References capacity(), pagePointer(), put(), and size(). Definition at line 37 of file PagePool.cc. References Ipc::Mem::PageId::maxPurpose, Must, and theLevels. Definition at line 68 of file PagePool.cc. References Must, Ipc::Mem::PageId::number, pageIndex, pageSize(), and theBuf. Referenced by level(), and Ipc::Mem::PagePointer(). Definition at line 35 of file PagePool.h. Referenced by Init(), and pagePointer(). Definition at line 56 of file PagePool.cc. Referenced by level(), and Ipc::Mem::PutPage(). Definition at line 37 of file PagePool.h. Definition at line 51 of file PagePool.h. Referenced by capacity(), get(), pagePointer(), pageSize(), put(), and size(). Definition at line 55 of file PagePool.h. Definition at line 54 of file PagePool.h. Referenced by get(), level(), and put().